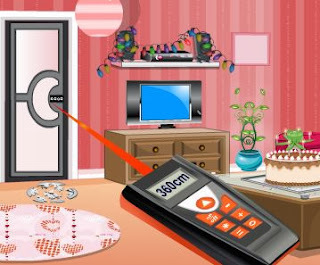 Full walkthrough solution with step by step instructions and detailed explanations on how to escape form the lovely pink room! Shake the curtains on the left. The butterfly will chase the cat on the carpet out of the room. Take the battery from the Christmas lights. There is also a blue puzzle piece hidden at the lights. Move the carpet to get a light blue puzzle piece. Take the laser distance meter from the top left drawer. Open the back of the meter and insert the battery. Take the knife from the bottom left drawer. Take the toy gun from the top right drawer. Load a blue ball into the gun. Load the other ball as well. Take the purple puzzle piece. Zoom in on the cam coder, open the side and take the CD out. Zoom in on the laptop on the right. Switch the printer and laptop on. Open the CD tray and insert the CD. 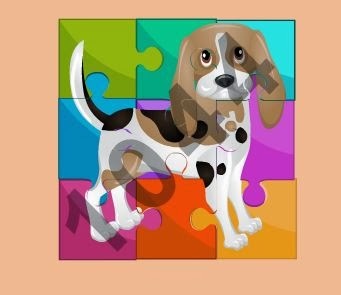 Click the icons on the laptop and it will show a picture of a puzzle piece. Cut the puzzle piece out with the knife. Use the toy gun on the TV. Then shoot both balls. The birds will fly away and release the note from the light. Open the note and take the last puzzle piece! 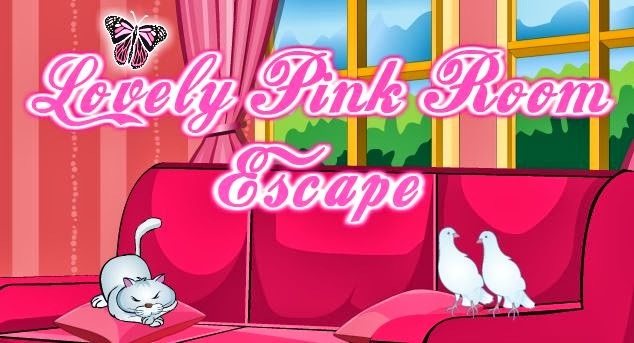 Lovely pink room is a lovely escape game. Not too easy, and not too difficult. Bring on some more! Thank you for the kind detailed walkthrough.